The Texas 5G Alliance was formed to advocate for the connectivity of the future. Our mission is to educate Texans on the exciting possibilities of 5G technology and the infrastructure that will be required to meet the demands of smart cities. The Texas 5G Alliance is a coalition of stakeholders that are unified behind the vision for a connected future in Texas. 5G is the next generation of high-speed wireless technology and is expected to provide connections at least 40 times faster—and four times greater capacity—than our current standard, what we know as 4G LTE. Timeline of mobile communication generations 1G – 5G. The way we communicate and stay in touch has changed dramatically over the past few years. Reliable access to mobile data has become critical to our daily lives, enabling communication, providing on-the-go internet access, and powering our “smart devices,” like home appliances, fitness trackers and digital assistants (think Amazon Echo or GoogleHome). In the next five years, 5G and the Internet of Things (IoT) will drive even more of our lives – and things – online, creating an even greater impact on our data and usage. With more mobile devices in the U.S. today than there are people, traffic on our networks and the demand for mobile data continues to grow exponentially. There will be 20.4 billion connected devices by 2020. In North America, data traffic per smartphone will grow nearly 5 times from 5.1 gigabytes per month in 2016 to 25 gigabytes per month in 2022. Mobile data traffic has grown 18-fold over the past 5 years and will grow 12-fold more by 2021. Improved wireless infrastructure, led by small cell nodes, is the leading solution to meet 5G demand and provide the necessary infrastructure to support the Internet of Things. How do small cells work? 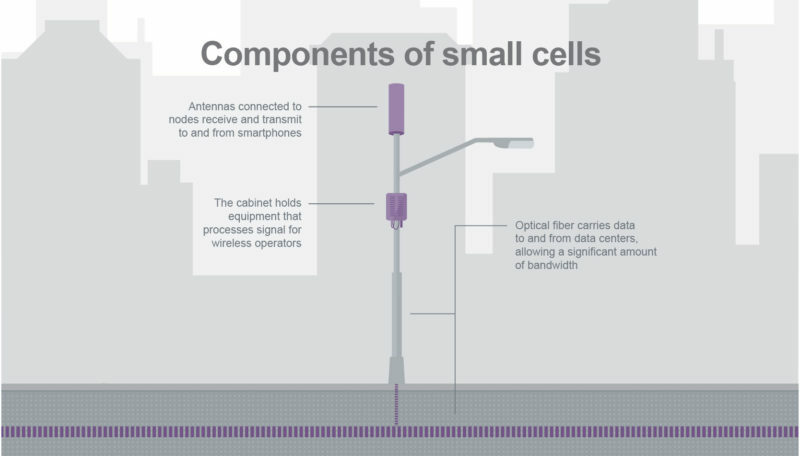 Small cell networks boost wireless coverage and network capacity by using a series of small “nodes”, connected by fiber, that work together with cell towers already serving communities. Small cells – as their name implies – are smaller and more discreet than traditional towers and are typically deployed on existing infrastructure like streetlights, utility poles, and traffic lights. Simply put, small cells create a superior overall wireless experience for users by densifying and expanding existing networks. Modern wireless infrastructure keeps us competitive in a rapidly changing global economy. Like railroads, highways, and airports constructed generations ago, small cell technology is what modern cities and countries need to stay connected and competitive. Wireless infrastructure and small cell solutions are vital to making our communities safer. Reliable coverage helps police officers, firefighters, and emergency medical personnel by providing access to the communications and information they need to respond quickly and appropriately. Improved wireless infrastructure also provides peace of mind, keeping families and loved ones connected. of public safety decision makers say that wireless data is just as important as voice. of readmissions have been reduced by remote monitoring of patients as relates to medical care. of all 911 calls originate from wireless devices. of school administrators prioritize mobile access when updating emergency response plans. There are more mobile devices in use in the United States today than there are people. With the appropriate infrastructure in place, your wireless carrier can more easily expand coverage and capacity to give you fast and reliable service. More small cells mean better service whenever and wherever you need it. Help us build a coalition of support for 5G in Texas! We are on the cusp of groundbreaking technology that will change the way we live our lives every day. As Texas continues to invest in innovative and life-changing technologies such as autonomous vehicles, robotic deliveries, traffic flow solutions, and dedicated public safety and first-responder networks, small cell infrastructure will be crucial to their implementation. Realizing the potential of 5G will require support and collaboration. Infrastructure providers, local governments, businesses, technology companies, organizations and associations, community leaders, and consumers all play an important role. Together we hope to show lawmakers and the public that Texans don’t want anyone slowing down our digital future. Please sign up to learn more about the Texas 5G Alliance and help us ensure we make investments now in the infrastructure necessary to move Texas forward.